Coach Paul Duncan shares a 16-week training plan to get you ready for your half distance race this summer. This plan is 16 weeks long and will prepare you for a half distance — also known as Ironman 70.3 — race. It is written using Zones via heart rate based on percentage of your threshold heart rate. Run: Running at least 1.5 hours per week comfortably and 45 minutes for a long run. Note: Bike and Run workouts are mostly written in duration. 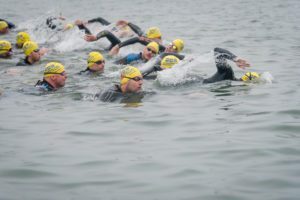 Swims are written in yardage and have an estimated swim time associated with them. If the swims take you much longer than the estimted duration prescribed, then shorten them to the presribed duration. AM Bike: 45:00 (Z1 progression) – Start at the low end of your Z1 heart rate zone, and finish towards the high end of the zone. PM Run: 40:00 Z1 Progression Run – Start at the low end of your Z1 heart rate zone, and finish at the high end. Try to make each mile have a slightly higher average heart rate than the previous mile, while sticking to Z1. Swim: 750yards total. Main set = 8×25’s at BEST EFFORT with 15 seconds of rest between. Remainder of total should be easy swimming during the warm up and cool down. PM Run: 40:00 (Z1 Progression) – Start at the low end of your Z1 heart rate zone, and finish at the high end. Try to make each mile have a slightly higher average heart rate than the previous mile, while sticking to Z1. Swim: 750yards total. Main set = 4×100’s at “perceived race pace” with 15 seconds of rest between. Remainder of total should be easy swimming during the warm up and cool down. Bike – 90minutes (Z1 progression) – Start at the low end of your Z1 heart rate zone, and finish towards the high end of the zone. Run: 60 minutes (Z1 Progression) – Start at the low end of your Z1 heart rate zone, and finish at the high end. Try to make each mile have a slightly higher average heart rate than the previous mile, while sticking to Z1. AM Bike: 45:00 @ Z1 with 3×3:00 LOW CADENCE INTERVALS. Use a resistance that allows you to ride at below 65RPM while staying around your Z1 heart rate zone. PM Run: 45:00 Z1 Progression Run – Start at the low end of your Z1 heart rate zone, and finish at the high end. Try to make each mile have a slightly higher average heart rate than the previous mile, while sticking to Z1. Swim: 900 yards total. Main set = 8×50’s at BEST EFFORT with 15 seconds of rest between. Remainder of total should be easy swimming during the warm up and cool down. PM Run: 45:00 (Z1 Progression) – Start at the low end of your Z1 heart rate zone, and finish at the high end. Try to make each mile have a slightly higher average heart rate than the previous mile, while sticking to Z1. Swim: 900 yards total. Main set = 5×100’s at “perceived race pace” with 15 seconds of rest between. Remainder of total should be easy swimming during the warm up and cool down. AM Bike – 120 minutes (Z1 progression) – Start at the low end of your Z1 heart rate zone, and finish towards the high end of the zone. Run: 70 minutes (Z1 Progression) – Start at the low end of your Z1 heart rate zone, and finish at the high end. Try to make each mile have a slightly higher average heart rate than the previous mile, while sticking to Z1. AM Bike: 50minutes @ Z1 with 3×5:00 LOW CADENCE INTERVALS. Use a resistance that allows you to ride at below 65RPM while staying around your Z1 heart rate zone. Swim: 1000 yards total. Main set = 10×50’s at BEST EFFORT with 15 seconds of rest between. Remainder of total should be easy swimming during the warm up and cool down. AM Bike: 50 minutes (Z1 progression) – Start at the low end of your Z1 heart rate zone, and finish towards the high end of the zone. Swim: 1000 yards total. Main set = 6×100’s at “perceived race pace” with 15 seconds of rest between. Remainder of total should be easy swimming during the warm up and cool down. AM Bike – 150 minutes (Z1 progression) – Start at the low end of your Z1 heart rate zone, and finish towards the high end of the zone. Run: 75 minutes (Z1 Progression) – Start at the low end of your Z1 heart rate zone, and finish at the high end. Try to make each mile have a slightly higher average heart rate than the previous mile, while sticking to Z1. Swim: 1000 yards total. Main set = 3×200’s at “perceived race pace” with 15-20 seconds of rest between. Remainder of total should be easy swimming during the warm up and cool down. AM Bike – 60 minutes easy ZR/Z1 as you feel. AM Bike: 50minutes @ Z1 with 3×8:00 LOW CADENCE INTERVALS. Use a resistance that allows you to ride at below 65RPM while staying around your Z1 heart rate zone. Swim: 1200 yards total. Main set = 12×50’s at BEST EFFORT with 15 seconds of rest between. Remainder of total should be easy swimming during the warm up and cool down. AM Bike: 50 minutes (Z1 progression) with 5×1:00 @ BEST EFFORT with even rest. Include “efforts” in 2nd half of ride, as close to the end as possible. PM Run: 50:00 (Z1 Progression) – Start at the low end of your Z1 heart rate zone, and finish at the high end. Try to make each mile have a slightly higher average heart rate than the previous mile, while sticking to Z1. Swim: 1200 yards total. Main set = 7×100’s at “perceived race pace” with 15 seconds of rest between. Remainder of total should be easy swimming during the warm up and cool down. AM Bike – 180 minutes (Z1 progression) – Start at the low end of your Z1 heart rate zone, and finish towards the high end of the zone. Run: 85 minutes (Z1 Progression) – Start at the low end of your Z1 heart rate zone, and finish at the high end. Try to make each mile have a slightly higher average heart rate than the previous mile, while sticking to Z1. AM Bike: 50minutes @ Z1 with 3×5:00 Z2 LOW CADENCE INTERVALS. Use a resistance that allows you to ride at below 65RPM while staying around your Z2 heart rate zone. PM Run: 50 minutes (with 3×30’s strides) Z1 Progression Run – Start at the low end of your Z1 heart rate zone, and finish at the high end. Try to make each mile have a slightly higher average heart rate than the previous mile, while sticking to Z1. In the last 20 minutes, insert 3x30seconds of “strides” or “sprints”. Recovery is 1 minute between each. Swim: 1400 yards total. Main set = 14×50’s at BEST EFFORT with 15 seconds of rest between. Remainder of total should be easy swimming during the warm up and cool down. AM Bike: 50 minutes (Z1 progression) with 2×3:00 @ BEST EFFORT with even rest. Include “efforts” in 2nd half of ride, as close to the end as possible. Swim: 1400 yards total. Main set = 8×100’s at “perceived race pace” with 15 seconds of rest between. Remainder of total should be easy swimming during the warm up and cool down. AM Bike – 200 minutes (Z1 progression) – Start at the low end of your Z1 heart rate zone, and finish towards the high end of the zone. Run: 95 minutes (Z1 Progression) – Start at the low end of your Z1 heart rate zone, and finish at the high end. Try to make each mile have a slightly higher average heart rate than the previous mile, while sticking to Z1. Swim: 1200 yards total. Main set = 4×200’s at “perceived race pace” with 15-20 seconds of rest between. Remainder of total should be easy swimming during the warm up and cool down. AM Bike: 60 minutes @ ZR/Z1 with 2×10:00 TEMPO pace (Zone 2). Recovery is 5:00 @ ZR/Z1 as you feel. Swim: 1700 yards total. Main set = 16×50’s at BEST EFFORT with 15 seconds of rest between. Remainder of total should be easy swimming during the warm up and cool down. AM Bike: 60 minutes (Z1 progression) with 3x3minutes @ BEST EFFORT with even rest. Include “efforts” in 2nd half of ride, as close to the end as possible. PM Run: 50:00 (Z1 Progression) – Start at the low end of your Z1 heart rate zone, and finish at the high end. Try to make each mile have a slightly higher average heart rate than the previous mile, while sticking to Z1. In the last 25 minutes, add in 3×30 seconds of hill sprints. Recovery is easy jogging back down the hill. Swim: 1600 yards total. Main set = 4×200’s at “perceived race pace” with 15 seconds of rest between. Remainder of total should be easy swimming during the warm up and cool down. AM Bike – 220 minutes (Z1/Z2 progression) – Progress through Z1 throughout the ride. Complete the last 30 minutes of the ride in your Z2 heart rate zone. Run: 100 minutes ( Progression Run ) – Start at the low end of your Z1 heart rate zone, and finish at the high end. Try to make each mile have a slightly higher average heart rate than the previous mile, while sticking to Z1. In the last 20 minutes, increase your heart rate to Z2 if you feel good. AM Bike: 65 minutes @ ZR/Z1 with 2×15:00 TEMPO pace (Zone 2). Recovery is 5:00 @ ZR/Z1 as you feel. Swim: 1900 yards total. Main set = 18×50’s at BEST EFFORT with 15 seconds of rest between. Remainder of total should be easy swimming during the warm up and cool down. AM Bike: 65 minutes ZR/Z1 with 3×5 minutes @ BEST EFFORT with 3 minutes rest between. Include “efforts” in 2nd half of ride, as close to the end as possible. PM Run: 55:00 (Z1 Progression) – Start at the low end of your Z1 heart rate zone, and finish at the high end. Try to make each mile have a slightly higher average heart rate than the previous mile, while sticking to Z1. In the last 25 minutes, add in 3×30 seconds of hill sprints. Recovery is easy jogging back down the hill. Swim: 1800 yards total. Main set = 5×200’s at “perceived race pace” with 15 seconds of rest between. Remainder of total should be easy swimming during the warm up and cool down. AM Bike – 230 minutes (Z1/Z2 progression) – Progress through Z1 throughout the ride. Complete the last 45 minutes of the ride in your Z2 heart rate zone. Run: 110 minutes ( Progression Run ) – Start at the low end of your Z1 heart rate zone, and finish at the high end. Try to make each mile have a slightly higher average heart rate than the previous mile, while sticking to Z1. In the last 25 minutes, increase your heart rate to Z2 if you feel good. Swim: 1400 yards total. Main set = 5×200’s at “perceived race pace” with 15-20 seconds of rest between. Remainder of total should be easy swimming during the warm up and cool down. AM Bike – 70 minutes easy ZR/Z1 as you feel. AM Bike – 240 minutes (Z1/Z2 progression) – Progress through Z1 throughout the ride. Complete the last 45 minutes of the ride in your Z2 heart rate zone. Run: 120 minutes ( Progression Run ) – Start at the low end of your Z1 heart rate zone, and finish at the high end. Try to make each mile have a slightly higher average heart rate than the previous mile, while sticking to Z1. In the last 25 minutes, increase your heart rate to Z2 if you feel good. AM Bike: 50 minutes @ ZR/Z1 with 2×20:00 TEMPO pace (Zone 2). Recovery is 5:00 @ ZR/Z1 as you feel. Swim: 2000 yards total. Main set = 20×50’s at BEST EFFORT with 15 seconds of rest between. Remainder of total should be easy swimming during the warm up and cool down. AM Bike: 50 minutes ZR/Z1 with 4×5 minutes @ BEST EFFORT with 3 minutes rest between. Include “efforts” in 2nd half of ride, as close to the end as possible. PM Run: 45 minutes (Z1 Progression) – Start at the low end of your Z1 heart rate zone, and finish at the high end. Try to make each mile have a slightly higher average heart rate than the previous mile, while sticking to Z1. In the last 25 minutes, add in 3×30 seconds of hill sprints. Recovery is easy jogging back down the hill. Swim: 2000 yards total. Main set = 6×200’s at “perceived race pace” with 15 seconds of rest between. Remainder of total should be easy swimming during the warm up and cool down. AM Bike – 200 minutes (Z1/Z2 progression) – Progress through Z1 throughout the ride. Complete the last 50 minutes of the ride in your Z2 heart rate zone. Run: 90 minutes ( Progression Run ) – Start at the low end of your Z1 heart rate zone, and finish at the high end. Try to make each mile have a slightly higher average heart rate than the previous mile, while sticking to Z1. In the last 25 minutes, increase your heart rate to Z2 if you feel good. AM Bike: 45 minutes @ ZR/Z1 with 20:00 @ TEMPO pace (Zone 2). Recovery is 5:00 @ ZR/Z1 as you feel. Swim: 2000 yards total. Main set = 20×25’s at BEST EFFORT with 15 seconds of rest between. Remainder of total should be easy swimming during the warm up and cool down. AM Bike: 40 minutes – OVER/UNDERS – 3x(5minutes @Z1, 5minutes @Z2). Warm up and cool down as you feel. PM Run: 40 minutes – OVER/UNDERS – Repeat cycle for duration of run.. 1 mile @ Z1, 1 mile @ Z2, continuous. Swim: 1000 yards total. Main set = Fartlek swim. Main: 25 hard, 25 easy, 50 hard, 50 easy, 100 hard, 100 easy. C/D: Easy swimming to final milage. AM Bike – 60 minutes (Z1/Z2 progression) – Progress through Z1 throughout the ride. Complete the last 30 minutes of the ride in your Z2 heart rate zone. Run: 60 minutes ( Progression Run ) – Start at the low end of your Z1 heart rate zone, and finish at the high end. Try to make each mile have a slightly higher average heart rate than the previous mile, while sticking to Z1. In the last 25 minutes, increase your heart rate to Z2 if you feel good. Swim: 1200 total swim. Main set, 10×25’s @ best effort. W/U and C/D should be nice and easy. AM Bike: 40 minutes – OVER/UNDERS – 3x(4minutes @Z1, 5minutes @Z2). Warm up and cool down as you feel. PM Run: 20 minutes – easy run, as you feel. Swim: 900 yards total. Main set – 2×200’s at 90% effort (simulated race pace) W/U and C/D as you feel. Bike: 20-30 minutes with 3x45seconds @best effort, 30 sec rest between. Run (can be a transition run): 10-15minutes as you feel. If you like, include 3x20sec at “race pace”.